If you grew up reading National Geographic, as I did, then you may be familiar with Steve McCurry, or at least have seen some of his photography. Many of his images have graced the cover over the years. In his book Sanctuary we have the opportunity to view a collection of McCurry’s photographs of the temples of Angkor, in Cambodia. Angkor Wat is likely the most famous of these temples, but the Angkor region is home to hundreds of temples, some of which may have been built from parts of previous temples. Pages 18-19. Buddhist monks among the temples. The book begins with a great essay by John Guy titled The Temples of Angkor. Guy provides some history of the region, its people, politics, culture and architecture. It’s interesting how the cultures and religions of the region changed over time and how this affected the character of the temples. There is evidence of animism, ancestral spirit worship, Hinduism, and Buddhism. The majority of the temples are Hindu. Today the region is visited by both tourists and Buddhist pilgrims. Pages 48-49. People worshiping and studying. The photography covers a range of subjects. Many are of the temples, some showing the vastness of these structures, others showing people, often Buddhist monks, among the ruins. I’m really drawn to the color contrast of the orange Buddhist robes set against the grays and browns of the stonework. Two sections of the book include detail shots of statues and carvings among the temples. These are printed on a textured cream toned paper, whereas the majority of the photographs are printed on a more standard white paper. Further into the book we see more photographs of people than of the structures. There are people worshiping, washing, resting, learning, and just going about their daily activities. These images provide a small window into some of the current culture of that region. Pages 54-55. Portrait of a Buddhist monk. The version of the book I own is hardcover with 120 pages measuring approximately 7.5 x 10.5 inches. There is also a softcover edition. The book was published by Phaidon Press. Pages 108-109. Photos of people, vendors and tourists. I love these photographs and would enjoy seeing them in a larger format. But larger format books, especially from good publishers, tend to be costly. So this smaller format keeps the book far more affordable. I like that the book is printed in a landscape format allowing the largest photographs to take up a single page. I’m always a little disappointed when a photograph spans pages, with the seam running through the length of the photograph. I’m pleased that’s not the case with this book. 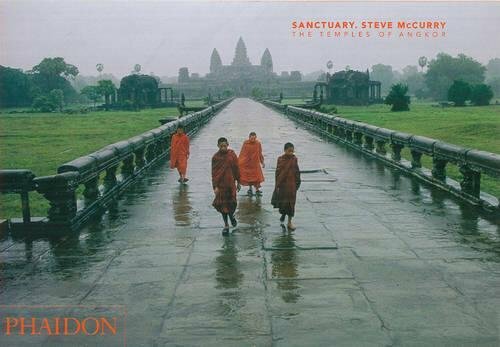 Go seek out a copy of Sanctuary if you enjoy Steve McCurry’s work or are interested in the people, culture and historical architecture of the Angkor region.